According to BAYADA Clinical Simulation Lead Adult Nursing Practice Angie Shaw, RN, BSN, simulation training uses realistic, life-like, computerized adult and pediatric manikins that allow nurses to respond to routine and emergency situations in a safe, controlled setting. This helps build the confidence and skills necessary to work one-on-one in the home with a patient with complex medical needs. BAYADA is leading the way in offering this training that is typically only available in a hospital setting. 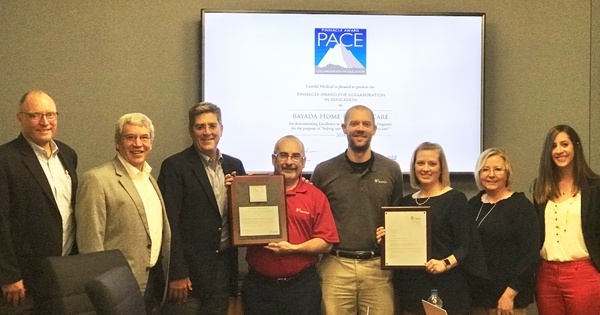 The PACE Award emphasizes leadership and innovation in simulation-based curriculum development, teaching, research, and community engagement. BAYADA offers simulation training for nurses at numerous locations throughout the country. To learn more, call 800-305-3000 or visit bayada.com/pediatrics.